Like other Microsoft products, MS Office 2013 is available under the VL (Volume License) program. We remind that Volume License is a licensing option for corporate customers that allows to purchase one registered license which can be used to activate a limited (or unlimited) number of copies of a software product. A Volume License does not dispense from the necessity to activate software. However, it is easier than the activation of a retail version, and this procedure can be managed from central location. We’ll talk about how to activate volume editions of Office 2013 on clients in corporate domain network under Volume License program. AD-based activation of Office 2013 is possible only for Microsoft OS, starting with Windows 8 / Windows Server 2012 and higher, while KMS and MAK activation is possible for all supported versions of Windows, starting with Windows 7. It should be noted that not only Office (Word, Excel, etc.) and Lync (now goes with Office), but also products like Visio 2013 and Project 2013 are activated during Office 2013 activation with a KMS. Now we will consider all the ways to activate Office 2013 for corporate customers. It should be reminded that the opportunity to activate Microsoft products with Active Directory appeared in Windows Server 2012. The function that allows to activate Windows or Office is called Active Directory-Based Activation – ADBA. When using ADBA, an Office 2013 client uses the existing Active Directory infrastructure to activate the product. If you installed Office 2013 on a device with Windows 8 / 10, and you specified the GVLK (Generic Volume License) key, Office will be activated automatically after joining this computer to the AD domain. Important: You can not use ADBA to activate Office 2010; this product does not support this mode. Open Volume Activation Tools console from the Server Manager snap-in. Then enter the KMS key (KMS Host Volume Activation Key) that your company has received and, optionally, its name. Now you have to activate the key in Microsoft: online (it’s easier, but the server must have Internet access) or by phone. After you completed these steps and the AD replication was successful, Office 2013, Visio 2013 and Project 2013 with a volume license will be automatically activated using the ADDS. Activation of Microsoft products with KMS server uses a client-server model in which there is a central node with the KMS role. KMS service on a domain server is installed and activated with KMS host (VL) key. Later all clients of this server will use this central server for activation, not the Microsoft servers. The same server can simultaneously act as an activation KMS server for different Windows and Office editions. 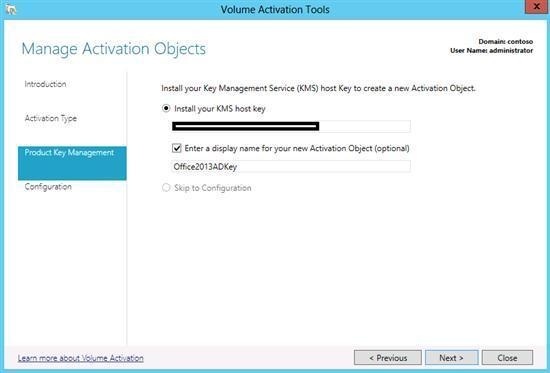 In general, KMS-activation of Office 2013 doesn’t differ from the activation of Office 2010. The only thing that should be noted is that in Windows Server 2003 the support of the KMS-server for Office 2013 is now absent. When activating Office 2013 in KMS, the product is activated for the period of 180 days, and from time to time the activation status is renewed. Remember that to activate Office 2013 on the KMS-server you need to have at least five clients (activation threshold). 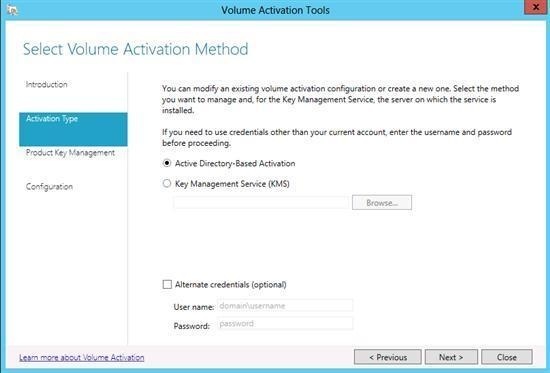 Windows Server 2012 uses a special graphic tool to manage a KMS-server – Volume Activation Tools. 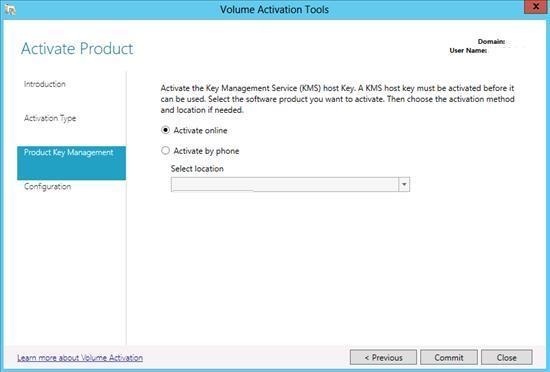 To get an opportunity to activate Office 2013 on the KMS-server, you have to install Microsoft Office 2013 Volume License Pack (like with the ADBA), select Key Management Service (KMS) as the type of activation in Volume Activation Tools, enter the CSVLK key and activate it in Microsoft. If there are no servers with Windows Server 2012 in your company and only servers with Windows Server 2008 R2 are available, you won’t be able to use Volume Activation Tools. To get support for Windows 8, Windows Server 2012 and Office 2013 activation on the KMS-server with Windows Server 2008 R2, you have to install a special update: http://support.microsoft.com/kb/2757817 (or KB2885698 for Windows 8.1 and Server 2012 R2). Download and install Microsoft Office 2013 Volume License Pack (see the link above). Click Yes when asked Would you like to enter a Microsoft Office 2013 KMS host product key and proceed with Internet activation now? The system connects to the Microsoft server and, if the connection is successful, a message of successful installation and activation of Office 2013 key appears. Please note that once installed, KMS will not be able to activate client by requests. As long as the Current Count value is less than 5, the KMS server will not issue licenses. It is necessary that at least 5 clients with Office 2013 access to the server for obtaining a license (activation threshold). KMS server can activate an unlimited number of clients. A MAK key is used only once to activate Office 2013 on the Microsoft server online. Each MAK key can activate only a certain number of systems determined by a corporate agreement. I. e. each MAK activation is added to the total number of activations on Microsoft servers. MAK Independent Activation. Each computer on which MAK activation is going to take place has to be connected to the Internet. This means that activation will suit the company with all computers joined into a corporate network. MAK Proxy Activation. The activation requests from clients are sent by a special proxy server that can be configured using VAMT 3.0 console. So, MAK keys are better to use either for the computers outside the corporate network or if the number of editions to be activated is less than five. Note that when using the MAK key, there is a risk of falling into the wrong hands, which will be difficult to track. You should understand that the way to activate Office 2013 depends on the type of the installed key. All computers with the volume edition of Office 2013 have a KMS key preinstalled (this key is called a GVLK – Generic Volume License Key). 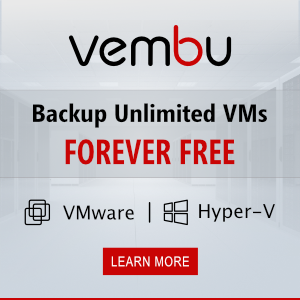 This allows to simplify system deployment in the corporate environment, because there’s no need to enter a product key on each computer. If Office 2013 is installed with the KMS key (GVLK), it can automatically find and activate itself on the KMS-server or in Active Directory infrastructure. After activation on the KMS server, any Office 2013 product can work without reactivation for 180 days, after which it will enter the evaluation mode and display a warning. In the event that a KMS server is available to the client, it automatically renews (every 7 days) the license for 180 days. 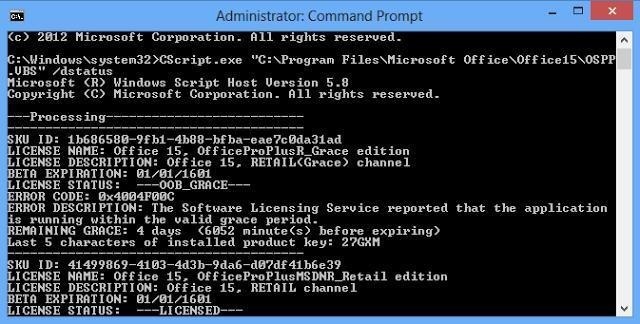 In the next table KMS keys for Office 2013 products are given. Grace period is granted for the volume Office 2013 products, while it is not available for retail products, i. e. you have to enter a valid key and activate your product during the installation. If the command returns the correct server address, verify that the port TCP/1688 is available from the client on the server. On the Office 2013 KMS server, you can’t activate Office 2010 or Office 2016, to support these products on the KMS server, you need to install special packages (a separate package for each version of the product). You can install this packs in any order, each one is activated by its own KMS Host Key. At the U.S. Environmental Protection Agency we are getting ready to deploy new Window 7 workstations and we are in need of installing Office 2013 on each computer. We are an isolated Lab network (no internet access). We have 100 computers to deploy and need assistance with figuring out what type of license to procure. What we general due is create a standard image of a machine that has all the needed software loaded. Then we just reimage this to the other computers. We are uncertain how we would activate the Office 2013 standard edition. We basically need the software to be a stand alone type version. Should we get a volume license and use KMS or some type of perpetual license? From a management perspective is much more convenient to use volume license model with KMS server. All computers with Office 2013 should have access to internal KMS server. KMS server itself does not need to have Internet access. GVLK key on KMS server can be activated once by phone. Alternatively, you can purchase a MAK key, but each copy of Office 2013 you must activate by phone. 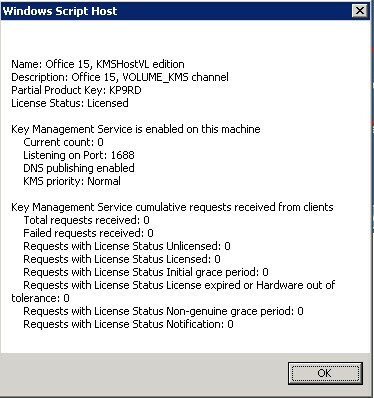 Hi, I have tried running the office licence pack on a 2008 R2 box with the KMS service installed on it, it already has the update to add support for 2012 and win7. When I run the install exe a cscript window comes up, stays blank and then disappears, any idea why? It never prompts for the Office 2013 KMS key. Check the System and Application logs for any related errors. 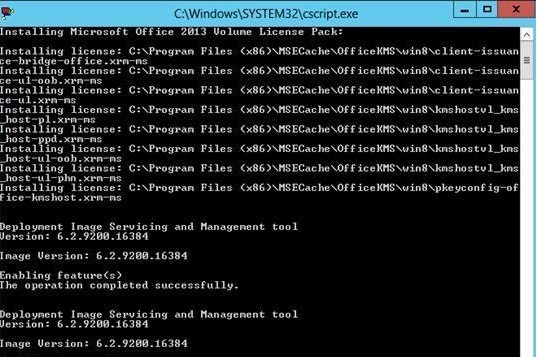 Try to install Volume License Pack from console session (mstsc /admin). Office 2013 is already installed on the client? I have installed Office 2013 ProPlus Retail. I would like to activate with Full version. Please let me know the procedure. Do I need to convert the Retail version to Volume Licence? Great post, for one who can’t activate,please try mskeyoffer(doc)com to get the genuine license , quite convenient .